Google has introduced a new button in Google Photos that will help you clear up some precious space on your phone or tablet. 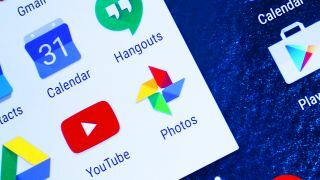 Google Photos, which reached 100 million active monthly users last month after splitting away from Google+ into its own standalone app, backs up photos from your device automatically. The new "Free Up Space" button lives in the Settings tab, and after tapping it, it will recognize and delete old photos that have already been backed up into the cloud, but only after confirming you want to delete the pictures. Unfortunately, the new on-device storage saving feature is only available through the Android version of the app right now, but the updated app can also delete copies stored on SD cards on certain Android devices, not just the onboard device storage. The "Free Up Space" option was previously available to users that were backing up photos in full resolution, or Original Quality, but this back-up option had the photos counting against your storage quota. The button is now open to users backing up photos through Google Photos in High Quality, which is a compressed version of the image that doesn't count against your online storage quota, making Google Photos' unlimited storage option even more attractive. Google is also rolling out an update to Google Photos on the web, which should stop you from reaching you online storage quota. And with most pictures likely to have been taken with your phone, compression shouldn't affect your photos too horribly. If you've almost reached your online storage quota though, from tomorrow you'll be able to downgrade any of your full resolution, Original Quality pictures saved to Google Photos to High Quality compressed versions, freeing up space.